At the terminal they literally unrolled the red carpet for us. 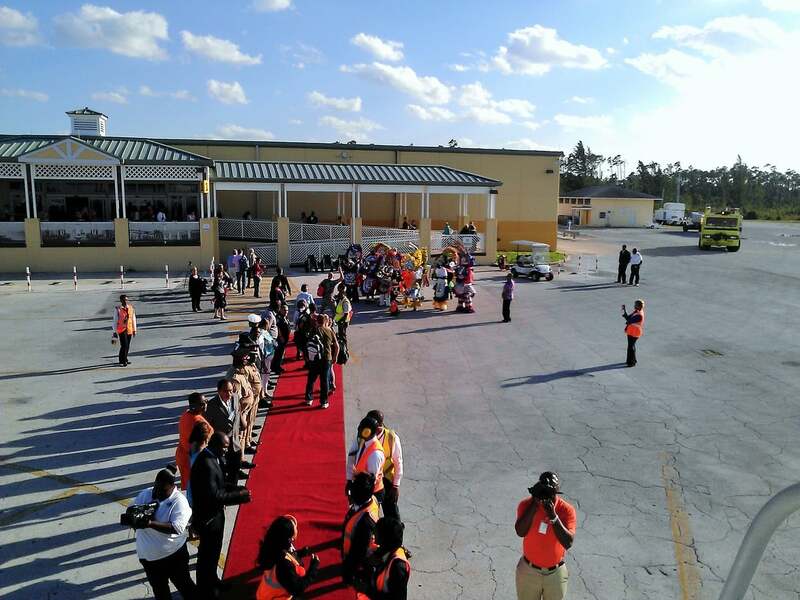 As our passengers disembarked, they walked down the carpet and were greeted by a number of officials from Freeport. Television crews were filming our arrival; this was a big deal. There was even a marching band playing for us! Inside the terminal our passengers were given free drinks (Bahama Mama’s!) 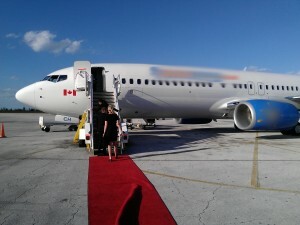 as a toast, welcoming them to Grand Bahama Island. Once all of our passengers had disembarked, we as crew came down and met the officials and took a few quick photos. A few of us went inside as well to visit the duty free store. They offered us drinks as well, however since we were in uniform we enjoyed only the fruit punch instead of the Bahama Mamas. Being an inaugural flight, we had no passengers to take home. 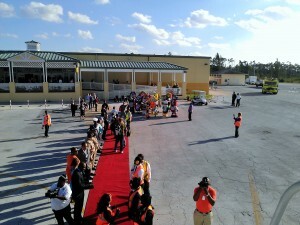 So as soon as everyone was off, the airport authority rolled up the red carpet. Once the crew returned to the aircraft and we finished fueling we took off back to Vancouver. It’s a shame, I would have loved to stay for a layover. Maybe I’ll get the chance sometime this winter. Fingers Crossed! 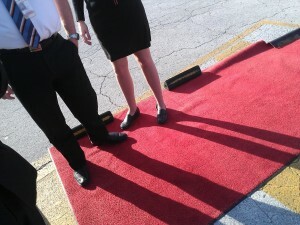 Red Carpet, Marching Band, TV crews! I’d like to thank my whole crew for supplying me with the photos they took! 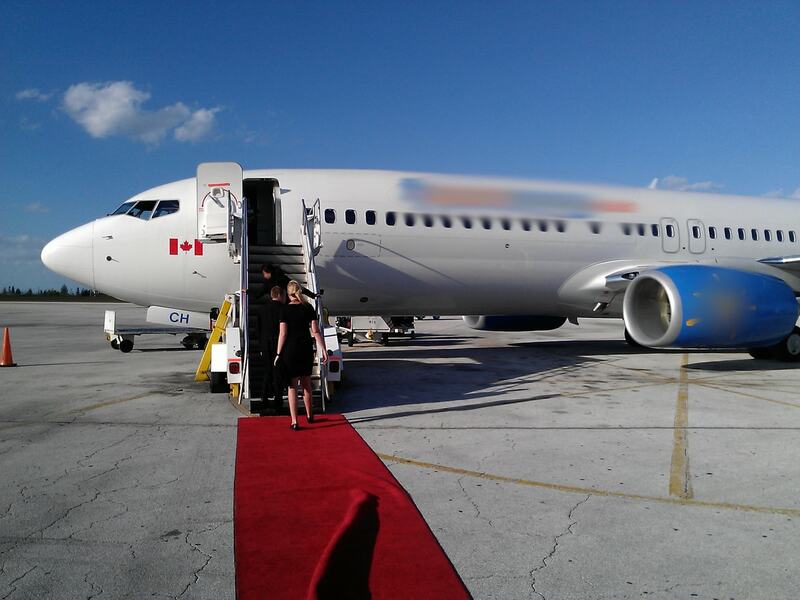 Unfortunately the airline either didn’t know FPO was going to give us a red carpet welcome, or they just didn’t tell the operating crew. I would have brought my good camera if I had known.